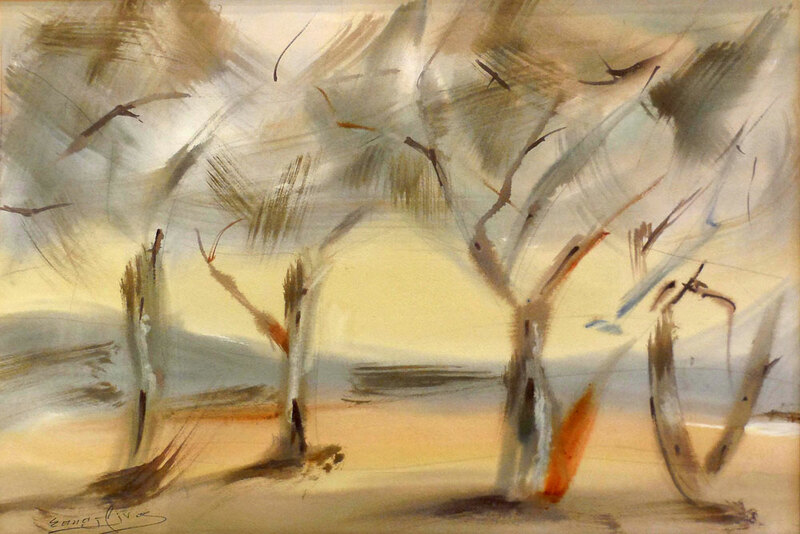 Spiros Sourtzinos, paints on wet paper. This makes the brushstroke look undivided∙ the wet paper helps to unite the color, to put one tone in the other, and with its calm gradations, the painting obtains a musical harmony. 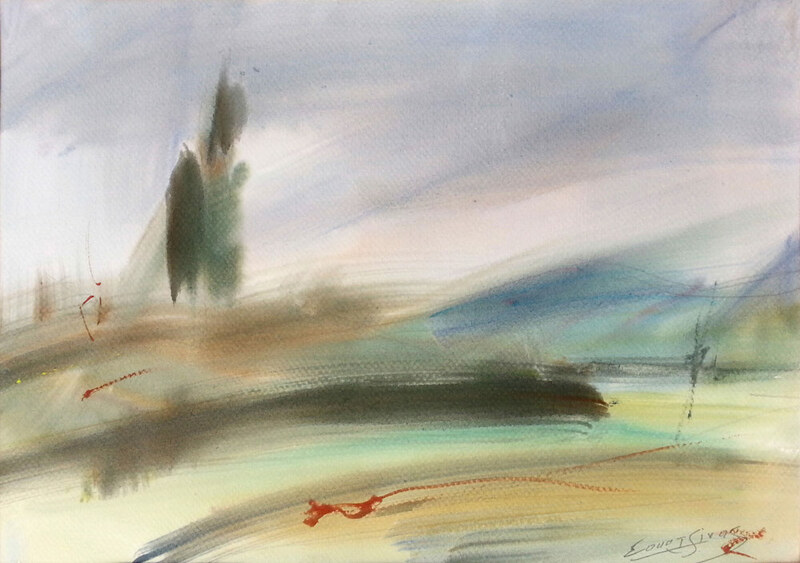 As a watercolorist he keeps renewing the tradition of his island in this kind, which was illuminated by virtuosos such as Vincent Bokatsiambis and Angelos Gialinas. 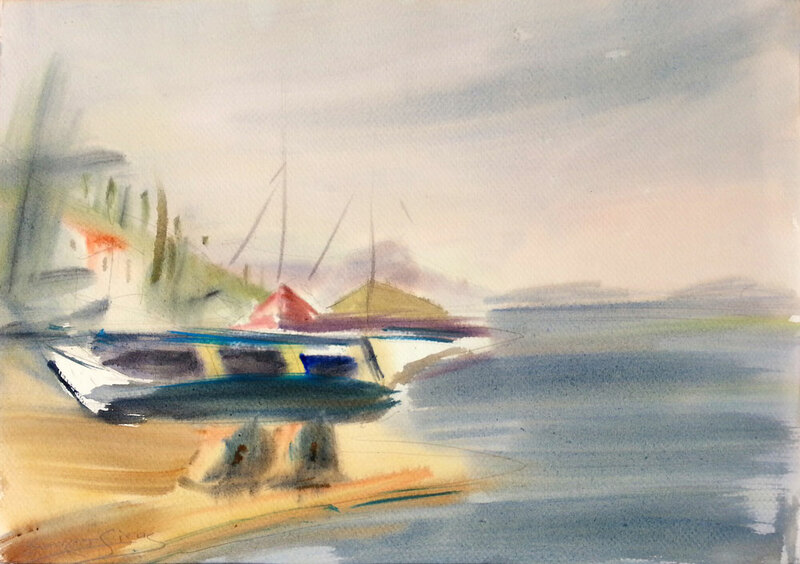 He has met the work of Giorgos Bouzianis and English Turner’s and of course has familiarized with the work of all the older Corfiot watercolorists and landscape painter. His subjects are pictures of the natural environment of Corfu: clusters of plants and lush landscapes, villages that emerge softly through the green, seascapes and boats of all kinds and, more rarely, tabletop concepts. 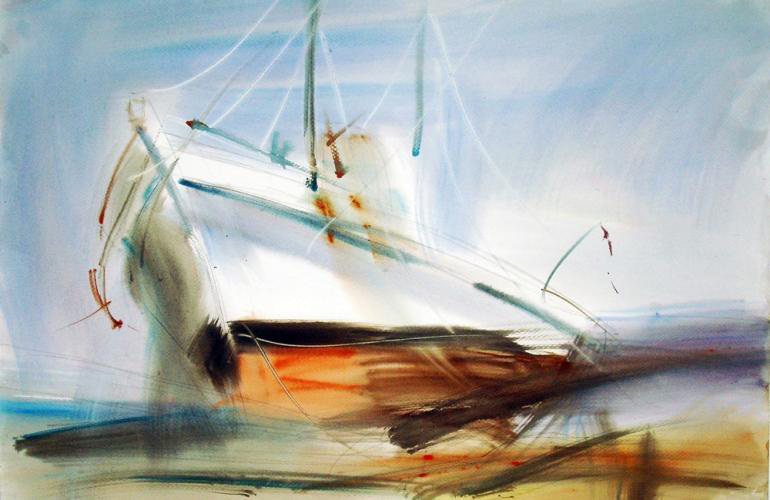 The paintings of Spyros Soutzinos are products of great sensitivity, that reflect his cross-fertilisation with the natural environment, resting the viewer’s eye and transmitting something from the sense of the spirit of things and the wet nature. Spyros Sourtzinos born in Corfu in 1948. He studied at the Art School in his hometown with the painter Angelo Conti, who initiated him in the art of watercolor.Sourtzinos is a graduate art conservator, member of the Chamber of Fine Arts, “International Institute for Conservation of Historic and Artistic Works”, and a founding member of the Panhellenic Association of Conservators of Antiquities. For several years he worked as a restorer of works of art in the Management Service of the Ministry of Culture. In the municipality of Corfu has worked repeatedly for maintenance paintings of the Municipal Gallery. Among the most important tasks is the maintenance and restoration of the old theater curtain San Giacomo, like the wall panels to Buckingham Achilles. The Sourtzinos has been honored with the “golden cross” of the Church of the Ecumenical Throne in the Dodecanese, the Patriarch Bartholomew (Patmos, 1994) and the Municipality of Corfu with the Gold Medal of the Summit in 2002. The “Hall Kreonidis” (Athens, 1981 “, in Reading Society of Corfu (1983) in Gallery Dada (Athens, 1989), the Municipal Gallery of Corfu (2003) and” Art Space Willian James »(Athens, 2006). participated also in more than 15 exhibitions in Athens, Patras and Corfu. 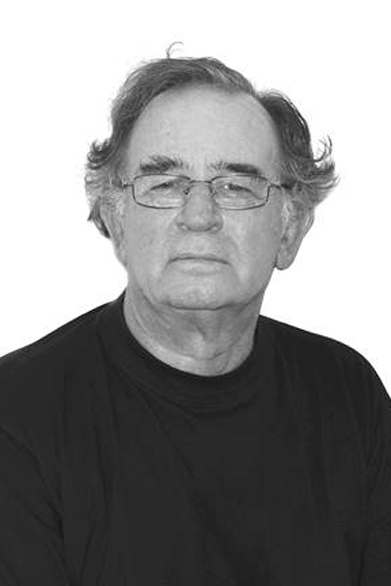 For his work Sourtzinou have written many critics, among them, Stelios Lydakis, Dora Iliopoulou Rogan Miltos Paraskevaidis Telemachus Ruse Nick Cholevas, Olga Sella, Marijana Tziantzi, Alekos Kapsokavadis. Thanos Christou,Klauss Gallas etc.